Are you visiting County Offaly? This part of the Irish Province of Leinster has a number of attractions you will not want to miss. Plus some interesting sights that are slightly off the beaten path. It is also home to President Obama's ancestors so you may find yourself in some famous company if you take your time and spend a day or two in Offaly when visiting Ireland? The Irish name of County Offaly is Contae Uíbh Fhailí, the literal meaning of which is "The Children of Failge" - referring to the legendary local king Failge Berraide (who reigned around 510). Between 1556 and 1920, Offaly was better known as the "King's County" - in honor of King Philip II of Spain (husband to English Queen "Bloody" Mary). The car registration issued in County Offaly has the letters OY on the license plate. The county town of Offaly is Tullamore, other important towns in the county are Banagher, Birr, Clara, and Edenderry. County Offaly measures out at an exact 2,000 square kilometers. The number of inhabitants stands at 78,003, according to the census of 2016. A common nickname for Offaly is "the Faithful County". On a less nice note, Offaly people (like the former Taoiseach Brian Cowen) are often declared to be Biffos – slang for a slur that stands for "Big Ignorant Feckers from Offaly". Then Barack Obama's Irish roots were discovered in County Offaly, so Biffo also became an acronym for "Black Important Fellow from Offaly". Though Clonmacnoise is never really on the way, a detour to see this monastic site is worth the time and gas. Situated at an ancient crossroads where the Esker Way and the Shannon intersect with a beautiful authentic High Cross, Clonmacnoise is never overrun by tourists. Thanks to its off-the-beaten path vibe in County Offaly, it is usually quiet and peaceful even on summer weekends. This and the simply wonderful location make it a worthwhile target for touring vacationers. Getting to Clonmacnoise can be a problem - you will need a good roadmap and then follow quite small and winding country lanes through Offaly. Keep in mind that because the site is next to the Shannon and quite low, you will only spot the towers in the last minute. Pride of place in the heritage town of Birr must go to Birr Castle, which is still in private hands and opposite a handy, but unfortunately ugly city parking lot. Once you enter the castle courtyard this ugliness is quickly forgotten. An exhibition tells you about the history of the castle, the landscaped grounds, plus a bit of astronomy. The 3rd Earl of Rosse was so taken in by stargazing that he not only studied astronomy​ but proceeded to build the world's largest telescope in his backyard. The aptly named "Leviathan" from the 1840s has been restored in recent years and is one of Ireland's most important technical monuments. The Irish Game and Country Fair at Birr Castle is a perfect way to discover life in the Irish countryside (or, at least, the lifestyle promoted for the genteel Irish countryman and -woman.) Either way, it makes for a great day out in Offaly. The fair is now an annual part of the County Offaly events calendar and well worth a visit. Actual displays change, but you can always expect living history as well as lifestyle shopping in true Offaly style. If you feel artistic or energetic, head for the Lough Boora Parklands - on the one hand you can find miles and miles of tracks through the (slowly) reclaimed boglands, on the other hand a sprawling sculpture park awaits you. With installations that are positively huge and often thought-provoking (and occasionally overgrown), this is a great visit. 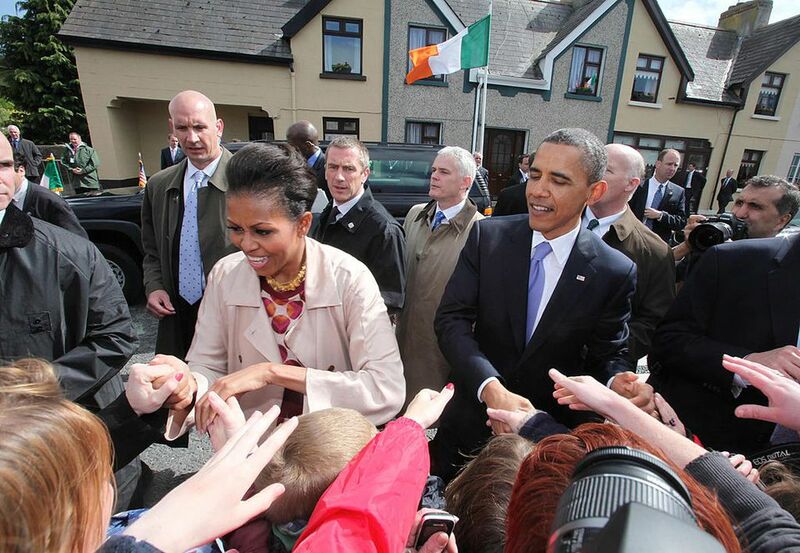 Since the moment Obama started running for president, and even more so after he was elected, change has certainly come to Moneygall in County Offaly. The quiet village, up to then mainly known for slowing traffic on the N7, suddenly re-invented itself as the "Obama Homestead. " In 2011, the great man himself arrived to see the small village with the usual amenities, some nice houses along the road and a pub which now flies the Stars & Stripes. This would be Ollie Hays', where the song "There's No One as Irish as Barack O'Bama" by Hardy Drew and the Nancy Boys had its premier in 2008. Visiting County Offaly and stuck for something to do in the evening? Well, you can always join the locals by taking a trip to the nearest pub (which, by default, will be an "original Irish pub") and then joining in for a traditional Irish session.